Cooper Webb wins his first 450 Supercross race at Anaheim 2. Cooper won Main Event 1 and Main Event 2 and then finished third in Main Event 3 to win the Triple Crown. 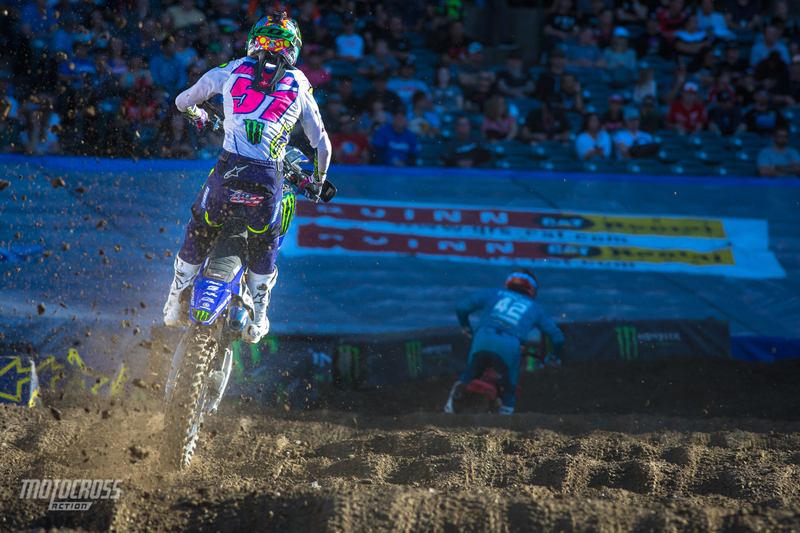 The third round of the 2019 Monster Energy Supercross series is in the books and Anaheim 2 did not disappoint! The Dirt Wurx crew did an awesome job of prepping the track after a long week of rain in Southern California and it made for great racing! 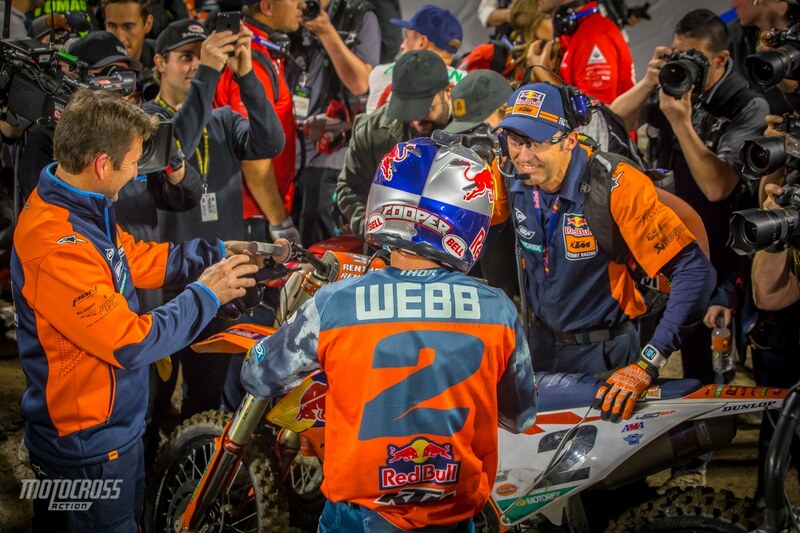 Cooper Webb grabbed his first ever win the 450 Supercross class on his new Red Bull KTM ride. 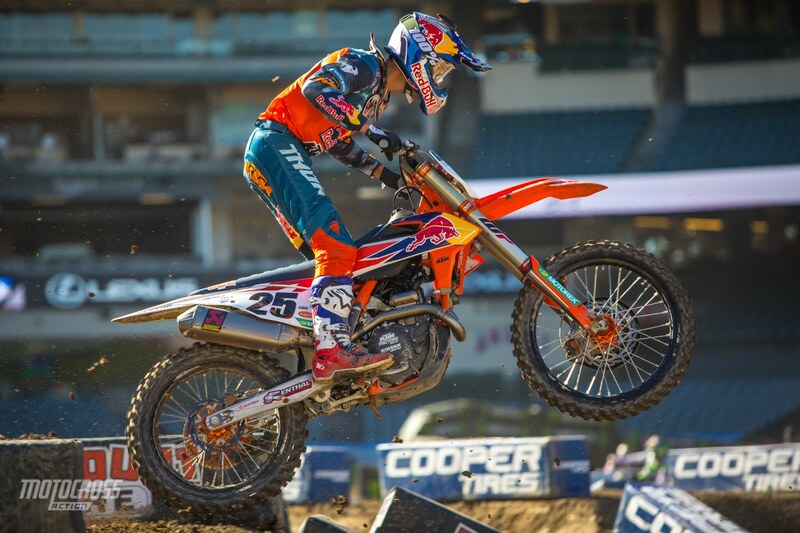 Cooper’s teammate Marvin Musquin finished second overall in the 450 class and Eli Tomac finished third overall. 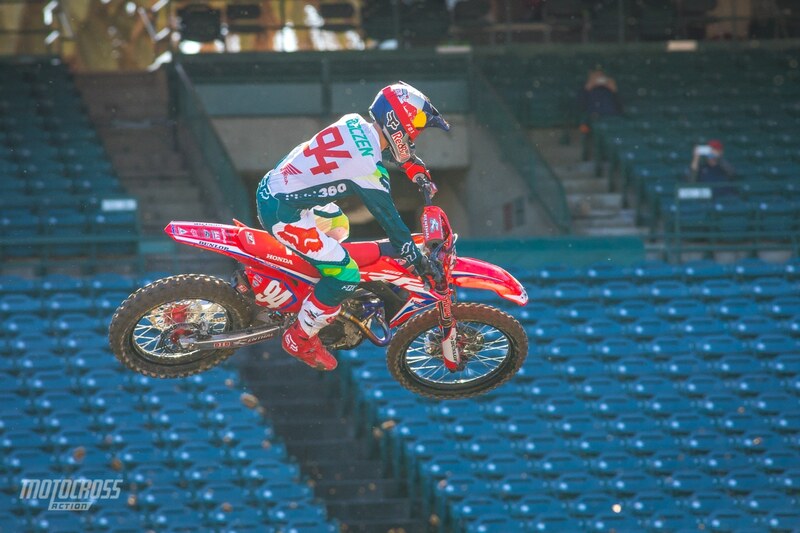 Ken Roczen was fourth and Dean Wilson fifth overall. POS. # RIDER M1 M2 M3 PTS. 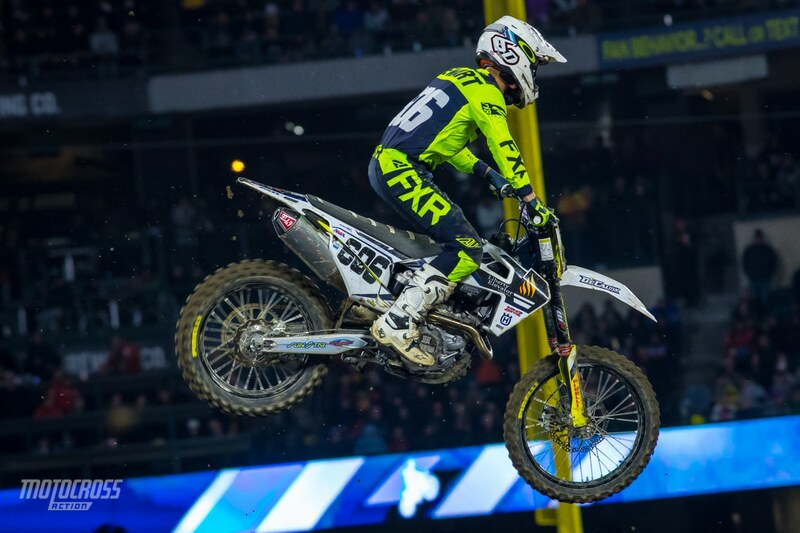 Cooper Webb wins his first ever 450 Supercross! Dean Wilson was never in the top five, but he was more consistent than everyone else and he scored himself a fifth place overall. Justin Barcia DNF’d the final Main Event, we hope he’s ok! 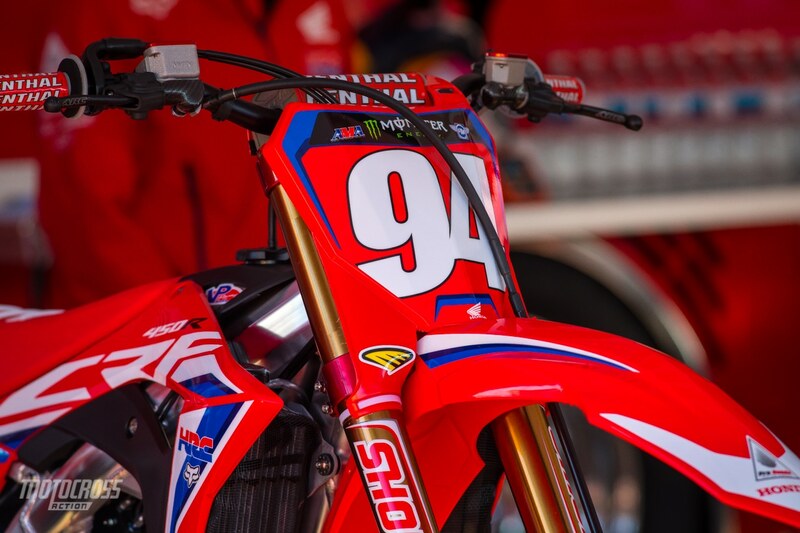 Ken Roczen will keep the points lead going into round four at Oakland. Round three of the 2019 Monster Energy Supercross season is under way and it has been an exciting one already! Cooper Webb made a last lap pass to win 450 Main Event 1 and he grabbed the holeshot and led 450 Main Event 2 from start to finish. Main Event 3 should be interesting, we all know that Cooper is one of those guys who rises to a whole new level when he is confident. 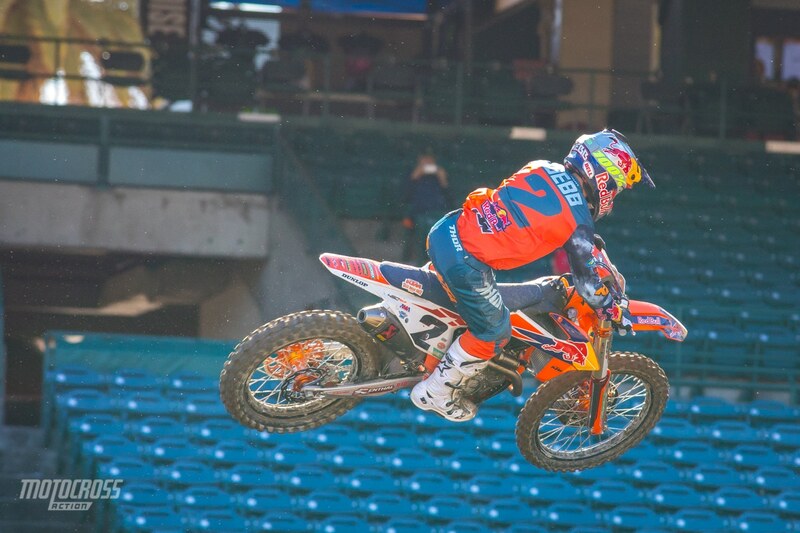 Behind Cooper was his Red Bull KTM teammate Marvin Musquin and third was Justin Barcia. Ken Roczen had a crash while he was running fourth, but he got up quickly and came back to finish 5th. 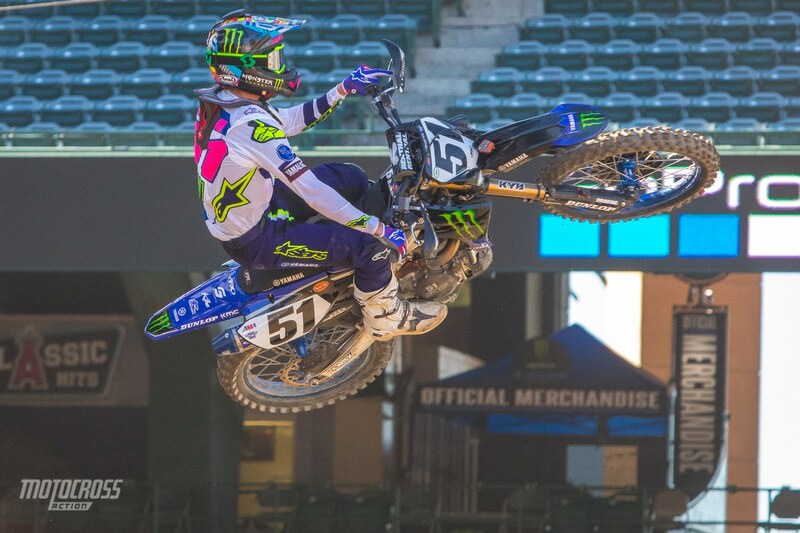 Cooper Webb is 1-1 after the first two Main Events of the Anaheim 2 Triple Crown. Marvin Musquin finished second in 450 Main Event 2. 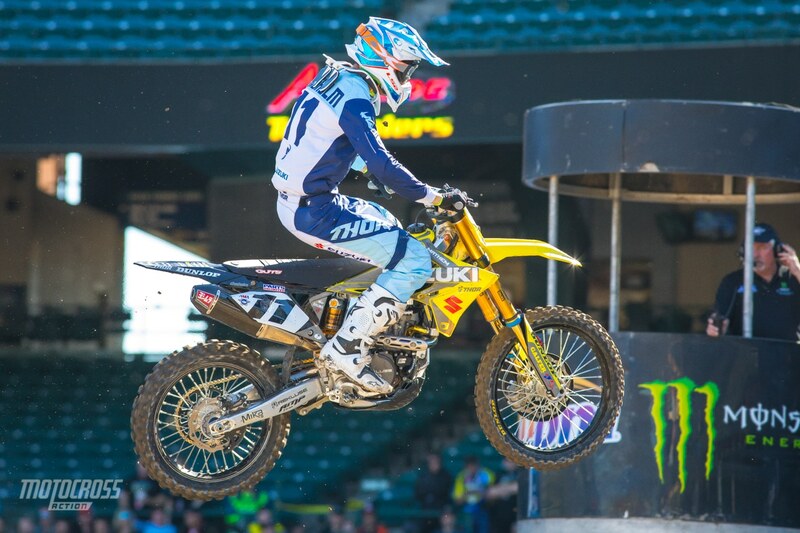 Justin Barcia finished third in 450 Main Event 2. Ken Roczen led 450 Main Event 1 all the way until two straightaways to go. Ken made a small mistake in a rhythm section. Ken doubled a jump while Cooper Webb tripled it and made the pass. 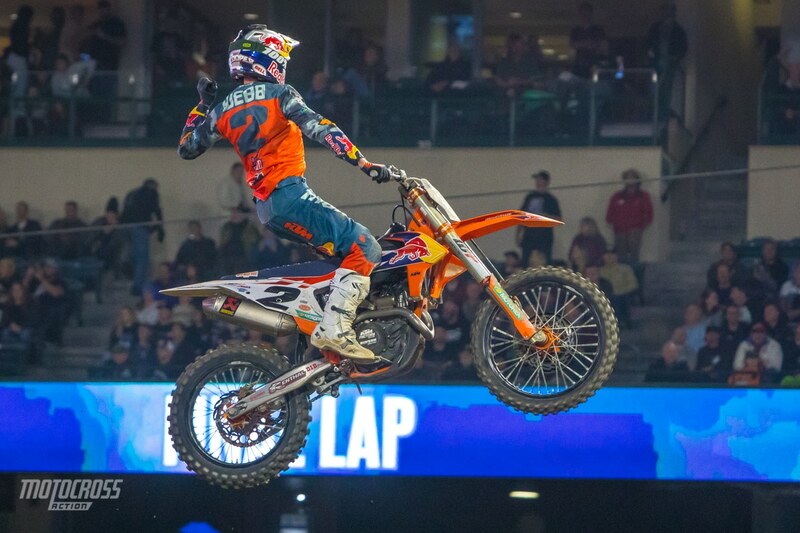 Ken finished second with Marvin Musquin third. We have two more 12-minute main events to go before we decide the overall winner of the first Triple Crown Supercross race of 2019. 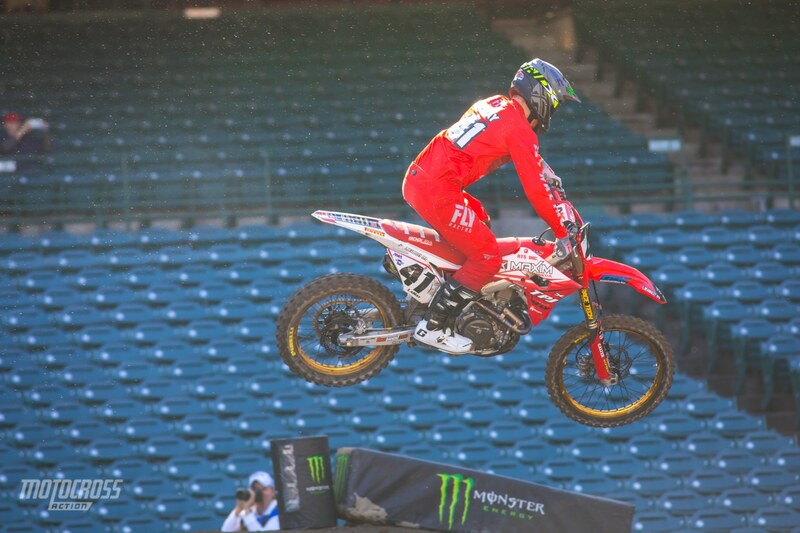 Ken Roczen was leading all the way until two corners to go when he made a mistake in 450 Main Event 1. Ben Lamay won the 450 LCQ. Most of the track was prepped up before the LCQs took place, but the whoop sections didn’t get groomed and they were rutted. There was a big crash in the first turn of the 450 LCQ. Kyle Chisholm went down hard and he took a couple riders with him. Ben Lamay was able to dodge the wreck get out front early. He took charge of the last chance qualifier and went on to win it. Angelo Pellegrini finished second and Austin Politelli finished third. 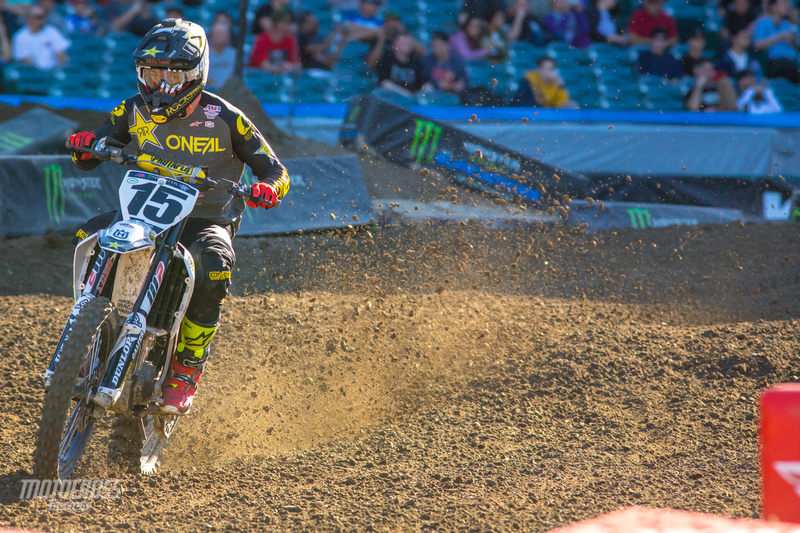 After battling back and forth with Carlen Gardner, Ronnie Stewart was able to get into the fourth place position and take the last spot in the 450 main event at Anaheim 2. 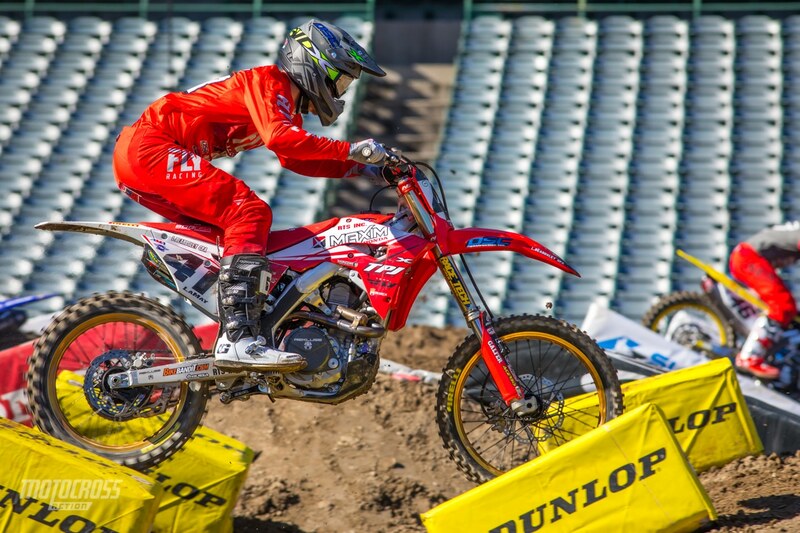 Ben Lamay, the Honda rider from Alaska won the 450 LCQ and transferred to the main event. Kyle Chisolm went down hard on the start in the 450 LCQ, we were happy to see that he got up walked away. Ronnie Stewart placed fourth and qualified for his second main event in a row.